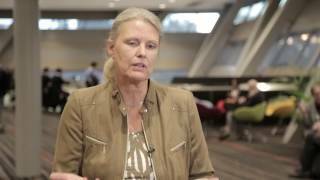 Irma Verdonck-de Leeuw, PhD of VU University Medical Center, Amsterdam, The Netherlands discusses online intervention approaches to treat insomniac cancer patients. It is already established that cognitive behavioral therapy (CBT) works for sleeping problems in general, however many cancer patients are fed up with a history of frequent hospital visits and are no longer interested in seeing further care professionals. This paved the way for online intervention to treat insomnia. Online interventions are found to be very effective in the general population for people who suffer with sleep disturbances, this has led to the testing of its effectiveness in cancer patients. A six-week course was developed for patients, which can be done in the comfort of their own home, acting as a guidance, self-help, online intervention. Each week they have a contact via email or telephone and are then given some assignments to work through. However, not all patients benefit from this online approach, so the next step is to enhance these interventions. Dr. Leeuw mentions that older patients are less likely to reach these interventions due to them not having access to internet, or they may not own a computer. Patients with a lower level of education are also more difficult to reach on average. There is now work focusing on improving reach to these demographics, with the aim to explore what assistance they need to help them reach online. It is highly recommended to use prompts in clinical practice, as it enables experts to see which patients for instance have insomnia problems, later referring them to the appropriate online intervention. Patients have the option to see a psychologist in person, or if they prefer to do it online, there is an option for them. Dr. Leeuw’s take home message is that online interventions are helpful, they are effective and patients can make use of it. Recorded at the Multinational Association of Supportive Care in Cancer (MASCC) and International Society of Ocular Oncology (ISOO) 2016 Annual Meeting on Supportive Care in Cancer held in Adelaide, Australia.